Introduced in 2015 with the Apple iPhone 6s and iPhone 6s Plus, 3D Touch allows iOS users to press (as opposed to touch) the screen to see previews, details, and shortcuts. Some applications allow users to Peek and Pop. For example, you can get a preview of an address in the Maps app. That's a "Peek." Applying a little harder force will "Pop" you into the app. Note that for technical reasons related to the Liquid Retina display on the iPhone XR, that model does not feature 3D Touch. 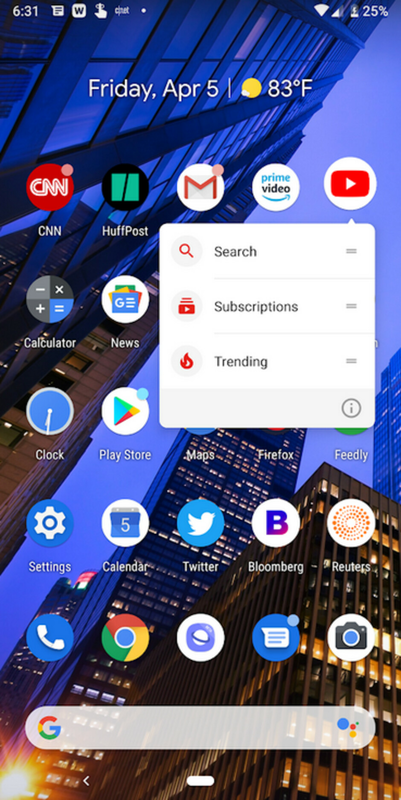 In Android 8 Oreo, Google added a long press gesture that allows Android users to see shortcuts related to certain apps. That feature was continued on Android 9 Pie. For example, press hard on the YouTube icon in either build, and you'll see shortcut options that can take you to the app's search feature, and a list of your YouTube subscriptions. According to 9to5 Google, documentation for Android Q reveals that the next Android build will allow users to see the same information, only faster, with a "deep press." Found inside documentation for MotionEvents (which deals with things on an Android device like the touchscreen, a stylus or a mobile mouse) is a statement that says a touch on the touchscreen can be classified as a "deep press" when a user presses harder on the screen intentionally. This will "accelerate the long press behavior." In other words, a "deep press" will reveal the same information as a long press, only quicker. Unlike 3D Touch, it doesn't appear that Android devices will be able to distinguish between a light press, a medium press, and a hard press. Google could turn to algorithms to determine whether a user is using enough force to count a touch as a "deep press." Or, the new feature might require specialized hardware. Either way, we could hear more about this during Google I/O. The annual developer conference will run from May 7th through May 9th. During the conference, Google traditionally reveals new features that will be found on the upcoming Android build. Just the other day, Google disseminated the second beta preview for Android Q. This included a foldable device emulator to help developers see how their apps will look on one of the new foldable phones that will be released soon. That includes the Samsung Galaxy Fold, due out on April 26th, and the Huawei Mate X. That model will be launched sometime this summer. Another feature called Bubbles allows you to take the functionality of certain apps with you from screen to screen on Android Q.
Google plans on releasing six beta versions of Android Q with the final version scheduled to drop during the third quarter. If you have a Pixel handset, you can quickly sign up to receive the Android Q beta versions OTA. Simply head to the Android Beta for Pixel website and click on the Devices tab. Scroll down to "Your Eligible Devices" and tap the Opt-in button. Expect to wait up to 24 hours before the update arrives. When you're ready to return to the public version of Android, repeat the process and tap on the Opt-out button. Keep in mind that the beta versions of Android are unstable and many of the features that you might depend on could fail to work. As a result, you might want to think twice before signing up to receive the Android Q beta previews. I thought android has all the features already. You have the functionality on Android, without the extra weight and cost. It was there before Apple added this gimmick. You’re trying just a bit too hard now. The fact is this kind of functionality was available via various launchers long before Apple introduced 3D Touch. I remember using it on my Xperia Z1 in 2012. It's nice to see Google making it a native feature though. Nothing wrong if your prefer to ignore history. Your choice. The truth is, as usual, Apple gets inspired by the competition and implements it. The difference is Apple sells alot more phones and its users don't know phones Apple didn't make. Hence when Apple does it, it seems new and polished. Everbody will be inspired with everything. For example, Android is heavily inspired by iOS fundamentally. But Apple steals the ideas to do it. Look, the whole "3d touch" thing that Apple did wasn't an original idea. It was simply an evolution of a "long touch", which was a touch screen devices equivalent of a "right click" with a mouse on a full computer. Long press and instant pop feel so different. I hate longpress. You may hate it; however, it's still an evolution of an old idea. Similar to face unlock from Android to face ID from apple. Bokeh pictures from the HTC M8 then portrait pictures on the iPhone 7. Bluetooth file transfers now air drop from Apple. Yeah just old tech rebranded, apple are masters of doing that. Right click with a mouse?? lol.. It took Apple forever to implement such simple thing on Mac OS. You aren't wrong. Apple has always been behind the curve when it comes to software. Their operating systems continue to be the more vulnerable than windows, year to year. PIxel already has this in Pie. I can see any wireless Bluetooth device battery percentage. How many phones were updated in pie? Oh well fragmentation at its best. I believe it's already exist before Marshmallow, I notice bluetooth headphone battery percentage since I got my first pair, and it's like 5-6 years ago. My Note 9 does the same thing with every battery-powered Bluetooth device I own. "In Android 8 Oreo, Google added a long press gesture that allows Android users to see shortcuts related to certain apps." Long press gestures were added in Android Nougat 7.1.1, not Oreo. PA writers never do homework before writing articles.